1 of 3 Heat oven to 350 degrees F. Coat 2 baking sheets with nonstick cooking spray. In bowl, combine flour, baking soda, salt and allspice. In small bowl, stir together the pumpkin and milk. In large bowl, beat sugar and butter until blended, 1 minute. Beat in eggs. On low speed, alternately beat in flour mixture and pumpkin mixture, ending with flour mixture. 2 of 3 Drop 1/4-cupfuls of dough onto prepared sheets, spacing 2 inches apart. Spread slightly with spatula. 3 of 3 Bake 1 sheet at a time in 350-degree oven 13 to 15 minutes, until toothpick inserted in centers tests clean. Remove cookies to rack to cool. 1 of 2 Blend confectioners' sugar, corn syrup, vanilla and 3 tablespoons plus 2 teaspoons milk until smooth. Remove 1/3 cup icing to small bowl and stir in cocoa and remaining 2 teaspoons milk. Transfer chocolate icing to plastic bag; snip off corner. 2 of 2 Turn cookies flat-side up. 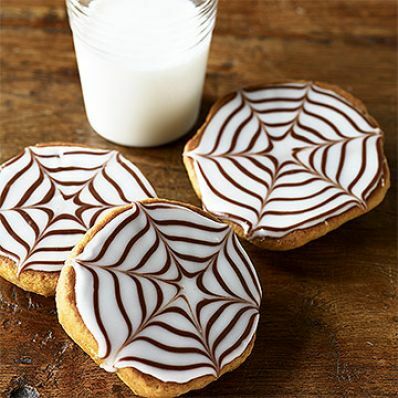 Spread white icing over one cookie. Beginning in center, pipe a spiral of chocolate icing onto cookie. Starting in center of spiral, drag a knife through spiral for spiderweb pattern. Repeat with all cookies. Let stand until set.